Perrierite-(Ce): Mineral information, data and localities. Named by Stefano Bonatti and Glauco Gottardi in 1950 in honor of Carlo Perrier (7 July 1886, Turin, Italy – 22 May 1948, Genoa, Italy), mineralogist and professor of mineralogy in the University of Genoa. 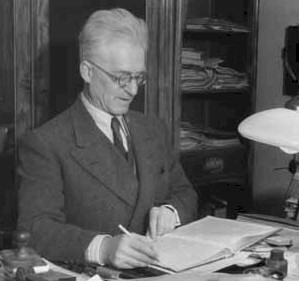 Along with Emilio Segre, he discovered the element technetium in 1937. Range observed: a = 13.59-13.61, b = 5.61-5.62, c = 11.63-11.73 Å, β = 113.28-113.95°. Thorite 2 photos of Perrierite-(Ce) associated with Thorite on mindat.org. Magnetite 1 photo of Perrierite-(Ce) associated with Magnetite on mindat.org. Zircon 1 photo of Perrierite-(Ce) associated with Zircon on mindat.org. Bonatti, S., Gottardi, G. (1950) Perrierite, nuovo minerale ritrovato nella sabbia di Nettuno (Roma). Atti della Reale Accademia dei Lincei, Rendiconti della Classe di Scienze Fisiche, Matematiche e Naturali: 9: 361-368. Fleischer, M. (1951) New mineral names. 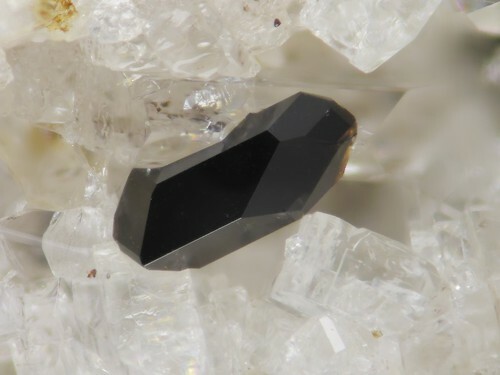 American Mineralogist: 36: 925-927. Bonatti, S., Gottardi, G. (1966) Un caso di polimorfismo a strati in sorosilicati: perrierite e chevkinite. Periodico di Mineralogia – Roma: 69-91. Ito, J. (1967) A study of chevkinite and perrierite. 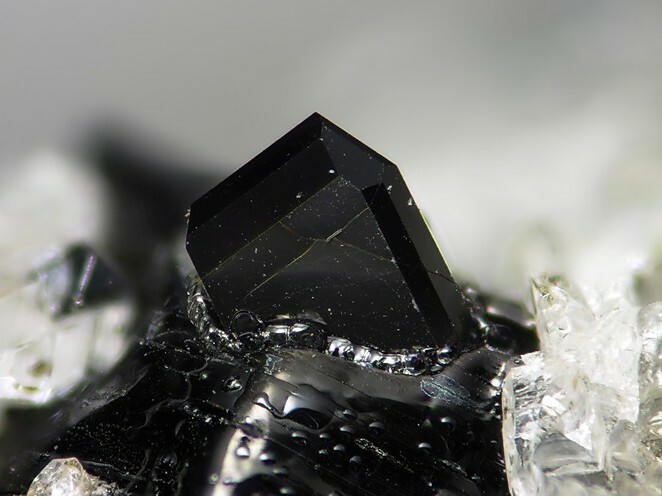 American Mineralogist: 52: 1094-1104. Parodi, G.C., Della Ventura, G., Mottana, A., Raudsepp, M. (1994) Zr-rich non metamict perrierite-(Ce) from holocrystalline ejecta in the Sabatini Volcanic Complex (Latium, Italy). 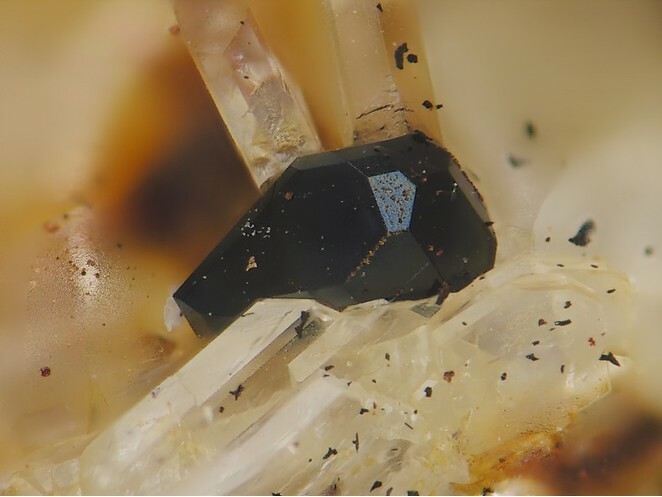 Mineralogical Magazine: 58: 607-613. Muhling, J.R., Suvorova, A.A., Rasmussen, B. (2014) The occurrence and composition of chevkinite-(Ce) and perrierite-(Ce) in tholeiitic intrusive rocks and lunar mare basalts. American Mineralogist: 99: 1911-1921. Stachowicz, M., Bagiński, B., Macdonald, R., Kartashov, P.M., Oziębło, A., Wożniak, K. (2014) Structure of Sr-Zr-bearing perrierite-(Ce) from the Burpala Massif, Russia. Mineralogical Magazine: 78: 1647-1659. Grew, E.S., Manton, W.I. (1979) Geochronologic studies in East Antarctica: Age of a pegmatite in Mawson charnockite. Antarctic Journal of the United States, 14:5, 2-3. Distribution and mineralogy of rare earth element–Zr–Nb–Ta mineralisation within pegmatite sheets at Citadellet, Kangerdlugssuaq alkaline intrusion, East Greenland. in Abdurrahman, A., J. C. Ø. Andersen, and B. J. Williamson. "Meeting of the Geological Society’s Mineral Deposits Studies Group was held on the 2nd–4th January 2013 at the University of Leicester, UK." Applied Earth Science (Trans. Inst. Min. Metall. B) 121.4 (2012): 212. Dahlgren, S. (2005): Miljøgeologisk undersøkelse av lavradioaktivt slagg fra ferroniobproduksjonen ved Norsk Bergverk på Søve 1956-1965. Regiongeologen for Buskerud, Telemark og Vestfold, Rapport nt 1, 2005. 19-28. Portnov, A.M. (1964) Strontium perrierite in the North Baikal region. Doklady of the Academy of Sciences USSR: Earth Sciences, 156, 118-120.; Vladykin, N. V., & Sotnikova, I. A. (2017). Petrology, geochemistry and source characteristics of the Burpala alkaline massif, North Baikal. Geoscience Frontiers, 8(4), 711-719. Bucholz, T. W., Falster, A. U., and Simmons, W. B., 2011, Chevkinite Group Minerals from the Wausau Complex, Marathon County, WI, 38th Rochester Mineralogical Symposium Progran and Abstracts, p. 11-12.